Gorgeous spacious cottage in pretty garden setting in sunny south east Ireland! Horseshoe Cottage is one of 4 beautiful stone cottages where you can relax and enjoy the pretty gardens and lovely views of the surrounding countryside. The cottages are located in a pretty prizewinning courtyard garden and each cottage has its own private patio/garden and BBQ. 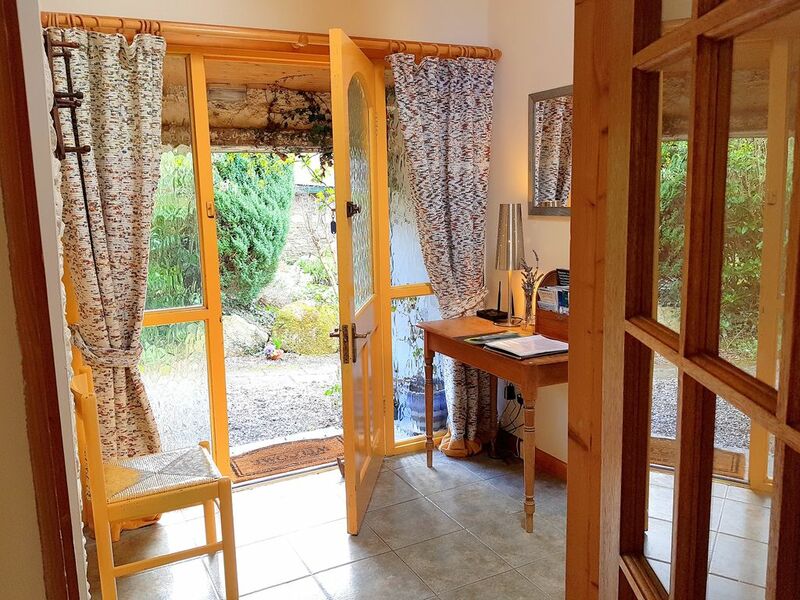 The cottages are all different, each with its own distinctive character, and they are spacious and equipped with everything you need for a relaxing holiday. There is lots to do in the area, and in the wider area. Within 15 minutes drive there are parks, gardens, castles, abbeys, a replica famine ship to visit as well as a wonderful coastline with lots of sandy beaches. The extensive J. F. Kennedy Memorial Park, 5 minutes away, has trees and shrubs from all over the world, lovely walks, good facilities for children and a viewing point from where you can see 5 surrounding counties. The JFK Ancestral Home at Dunganstown is 5 minutes from the farm. The 'Dunbrody' Famine Ship Visitor Experience In New Ross, 10 minutes away, and you can also visit Ros Tapestry which depicts our Norman history in 15 large richly embroidered panels and St. Mary's Abbey in New Ross founded in the 12th Century after the Norman invasion. Close to us is Dunbrody Abbey and also Tintern Abbey, Cistercian abbeys built by William Marshall in c. 1140, from where the small harbours and sandy beaches of Hook Peninsula stretch southwards. The Irish National Heritage Park, near Wexford, has won awards for its visitor experience and, apart from the wealth of knowledge that can be gained from various reconstructions of life through the ages, it provides wonderful walks in beautiful surroundings. With Waterford, Wexford, Kilkenny about half an hour away and Dublin and Cork a 2 hour drive, the farm makes an excellent base for exploring the sunny southeast corner of Ireland! We would love to welcome you to one of our beautiful farm cottages where you can relax, unwind and enjoy the pretty gardens and lovely views of the surrounding area. The farm is in a quiet rural area with sweeping views of the Barrow Valley and estuary and it has been in Patricia's family for generations. Its area is 120 acres and the main enterprise is tillage, with grazing for cattle and sheep. Our five stone cottages ooze character and have been renovated and restored to retain their many traditional features while providing the comforts and luxuries necessary for a calm relaxed holiday in a friendly atmosphere. Each cottage has its own south facing private patio with BBQ, and each has a large flat screen satellite TV and complementary Wi Fi. We live in the main farmhouse nearby and are at hand for any extra information about the farm history and the area. Exploring the Area: The Hook Peninsula, with its rocky coastline, safe sandy beaches and fishing harbours, stretches south to Hook Lighthouse, the oldest in Europe. The many castles and ruins in the area include Tintern and Dunbrody Abbeys and Slade Castle. There is terrific choice of golf, par 3 and pitch & putt with 10 excellent golf courses within 25 miles of the farm. A well-run local equestrian centre is popular for horse riding, as is racing at Tramore, Gowran Park and Wexford. Five major rivers flow through the region providing excellent fishing for trout and salmon, while sea angling and wreck fishing are available off the coast, and Oaklands Lake nearby is popular for coarse fishing. Five signposted drives in the area bring you through hills and valleys, lush pastureland, with rugged coastline and many historical sites. Northwards are the Blackstairs and Wicklow mountains and to the west are Tipperary's Comeragh mountains, popular with hill walkers, as is the extensive coastal path. Nearby places to Visit: Within 4 km is the extensive J.F.Kennedy Memorial Park which has a vast collection of trees/shrubs and a viewing point offering panoramic views of 5 counties the coast and the Saltee Islands, a notable bird and wildlife sanctuary. J.F.Kennedy Ancestral home, 4 km, has family memorabilia of the former U.S.President. In nearby New Ross you can visit the replica emigrant ship 'Dunbrody' where transatlantic crossings of the 1840s are re-enacted and see fabulous Ros Tapestry. A tour of famous Waterford Crystal Visitor Centre is a must, as is historic Kilkenny city and castle. Irish history and heritage can be explored with day trips to see The Rock of Cashel in Tipperary, kiss the Blarney Stone and visit Jamesons Distillery and the English Market in Cork, visit the monastic settlement at Glendalough, Co. Wicklow. Travel to Dublin and take the sightseeing bus, and a host of other possibilities. The farm is in a quiet, tranquil location, away from it all, yet near to so many amenities! Roger and Patricia live in the main farmhouse, close to the cottages, where Patricia's family has lived and farmed for many generations. We are on hand to chat with guests and help with questions and information. The five stone built cottages on the farm were originally stables, farm dairy, granary and coach house with various other uses over their long and colourful lives. Each was restored and converted and re-incarnated into cottages by Roger and Patricia over the past 20 years, with each cottage having its own distinct character and space. Each cottage has its own special features, be it natural stone walls or beamed ceilings, one has a traditional half door, another has a canopied bed and several have wood burning stoves. They have a private garden area within a large richly planted garden with lovely views of the Barrow valley. En-suite bathroom has shower enclosure and toilet. Main bathroom has bath with shower over, and toilet. One large bath sheet and hand towel per person and also kitchen towels etc. Very large living area with high ceiling, with the kitchen & dining area on the ground floor and a slightly elevated lounge with couch and easy chairs, a large feature chimney separates the two areas. Ample crockery, pots & pans, cutlery and utensils provided. Large, bright, well-equipped kitchen which opens onto a sunny private patio with table & chairs and BBQ. A dining table in kitchen has seating for 4. Mature courtyard garden with seating, shared with 3 other cottages, each of which has its own private patio and BBQ. Private south-facing paved patio with table & chairs directly accessed from kitchen. Children are welcome. We can provide cot & highchair, etc. on request, at no extra charge. We welcome a well-behaved dog. In the interests of hygiene and in consideration of other guests we ask that pets not be allowed on the furniture or in the bedrooms please. There is complimentary wi fi available for guests. Our gorgeous converted stone farm cottages are nestled in the pretty countryside of the Barrow valley surrounded by patchwork of fields and hills in the sunny south east of Ireland. Nearby is the historic market town of New Ross and the Hook Peninsula with its sandy beaches, rocky coastline and Hook Lighthouse. Enjoy a range of activities from golf, fishing, horse riding, all water sports, hill & coastal walks and garden visits to bird watching and whale watching. Visit beautiful JFK Arboretum/Forest Park nearby with a vast array of trees and shrubs and enjoy the amazing panoramic views of the 5 counties of the south east and its coastline from its viewing point. Irish heritage can be explored with many historic abbeys and castles in our area including St. Mary's Abbey, Dunbrody Abbey, Tintern Abbey and Reginald's Tower. History comes to life at the award winning Irish National Heritage Park, a delightful venue in a charming setting for adults and children. The Tall Ship 'Dunbrody', moored at New Ross quayside has re-enactments of the hardships and experiences of emigrant transatlantic crossings of the 1800s. A new focal point on New Ross quayside is the Eternal Emigrant Flame and Sculpture commemorating the late USA president JFK's family links in the area and his ancestral home nearby, and Ros Tapestry along the quayside depicts the early history of New Ross in a series of large hand-stitched colourful panels. There are 10 Golf Courses in the area and also Par 3, Pitch and Putt and a Driving Range nearby. Horse riding is available close by and Horse Racing at Tramore, Gowran Park and Wexford. This is a quiet and tranquil location that is close to a great many amenities and places of interest. Waterford city, of Crystal fame, with its Viking Quarter and Kilkenny city, with its famous Castle and Design Centre, and Wexford, a vibrant bustling town, are all around 30 minutes' drive, and Cork and Dublin are 2 hours by car.